Since the opening of the first Madame Tussauds in London, many branches have unfolded across major cities in the United States such as New York, Washington, D.C. and Hollywood. Madame Tussauds Wax Museum's main attraction is that it allows visitors to rub shoulders with the rich and famous. Want to mingle with the actors of Breakfast at Tiffany's or take a photo with President Obama? 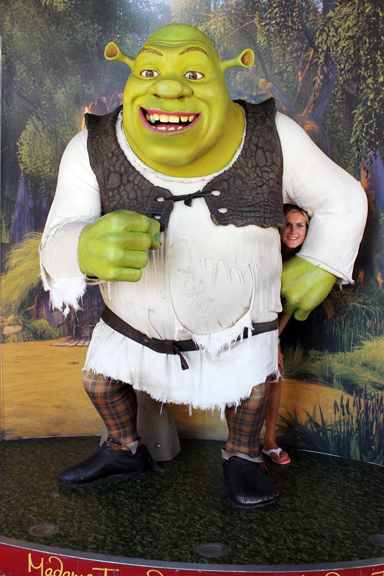 Madame Tussauds features politicians, music and entertainment icons as well as beloved animated characters such as Shrek. To recreate famous figures in wax is a meticulous process; each detail is taken into careful consideration and each body part and characteristic, from hair to shoes, involves a long process with a dedicated team of individuals. Just to give an idea of how long one wax figure may take: it takes 10 hours to make each pair of eyes, six weeks to make a full head of hair and an average of four days to make a set of teeth. The hair can actually be removed, cut, styled and washed over and over again. The clothes are either donated from the "sitter" or replicated by a team of freelancers. Shoes, if new, would have to be worn to create a natural worn-in look. Maintenance is key to keeping the flesh of these wax figures glowing. Some of the figures look so life-like that when celebrities such as Al Roker stood in place of their wax figures, visitors were surprised to learn they'd actually been looking at the real thing!